Robert X. Fogarty (’01), 27, is the director of evacuteer.org and founder of Dear World. He started evacuteer.org after assisting the City of New Orleans to evacuate 18,000 residents without cars in advance of Hurricane Gustav, the largest hurricane evacuation in U.S. history. Evacuteer.org trains 500 volunteers each year to assist in the event of a mandatory evacuation and fills a critical component of the City of New Orleans’ emergency operations plan. The non-profit organization also researches and promotes innovative hurricane preparedness strategy. 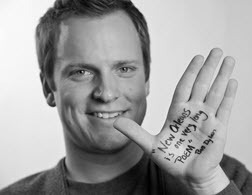 In 2011, Fogarty started Dear World, a scalable version of Dear New Orleans, his for-profit photography venture for social good. Fogarty has photographed thousands, including Super Bowl Most Valuable Player Drew Brees, Academy Award Winner Susan Sarandon and NBA All Star Chris Paul. His photos are viewed 1.5 million times every month online, and 10 percent of Dear New Orleans’ revenue goes to evacuteer.org. Fogarty was also a Keynote Speaker at the recent Social Enterprise Annual Conference. He graduated from the University of Oregon School of Journalism in 2005.